Humanoid robot hobbyist Michael Overstreet — that is to say, Michael Overstreet, whose hobby is humanoid robotics, not that he’s a humanoid himself — though of course he is, as all humans are humanoid by definition and Michael is certainly one, but — let’s start over. Michael Overstreet has achieved prominence in the U.S. humanoid robotics scene via his Bioloid-based robot “Boomer,” and is now taking it up a notch by trying to 3D print his own DARwIn-OP. 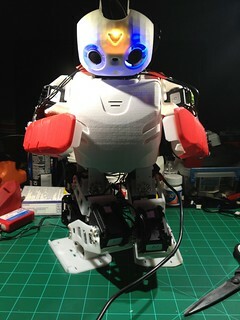 The Darwin is a fairly high-end research/education robot based on twenty Robotis MX-28 servos. Those servos are quite pricey, so the robot as a whole is still going to cost him about $6k — but that’s about half what an off-the-shelf Darwin costs. Michael’s Darwin clone, named “Robby,” isn’t quite able to walk yet, but it’s getting close. Building a humanoid robot can be a long, difficult task, even when you have a well-developed open platform to work from. Read more about it at Make, and follow the progress at Michael’s blog.